Happy Valentine's Day Everyone! Today we are joining Jill of Gypsy Brocante who is hosting the Porch Club Monday's Party and we are celebrating by whipping you up a "Chocolate Surprise Cake", my Grandma cut this recipe out of the Los Angeles Times on July 14th, 1977. Well that was way before I was born...my Mommy was just 3 years old. So here we go..Magic ingredients, 1 pkg of chocolate cake mix (18 1/2 oz) "hope they still make that size Grandma said," 1 pkg of instant chocolate pudding mix (3 3/4oz ) 1/2 cup oil, 4 eggs and 1 (17 0z) can blueberries, drained (save the juice) and powdered sugar for later. Now combine cake mix, pudding mix, oil and eggs in a bowl. Mix the saved blueberry juice with water to make 1 cup liquid. Add to mixture, mix, (see how I'm doin' it) Now when all mixed up fold in the blueberries and pour into a greased and floured 9 cup bundt pan and Bake at 350 degrees for 50-60 minutes. Remove from oven and cool 25 minutes, sprinkle with powder sugar and serve! Top with lots of Whip cream, Yummo ! Hope ya like it! Give Jill a Big Valentine's Hug for having this Party! My Grandma said to tell you if you would like to read their "Love Story" you should go visit "Share Your Love Story" at My Desert Cottage today as it is all about Love Stories including my Grandma and Grandpa's, Grandma said I'm their Legacy (what ever that is?) and I'm one of their Treasures, I never met Grandpa, maybe I should go check him out? I bet he would like my recipe! That looks really good and you look like a great little cook. Happy Valentine's Day. Hey porch club friend! I am having the hardest time reading these delicous post when dieting.......So sweet! Oh lord this is sounding so good ... and dangerous!! I can eat a chocolate cake in a sitting ... I wish we really could have all these goodies today on the porch!! 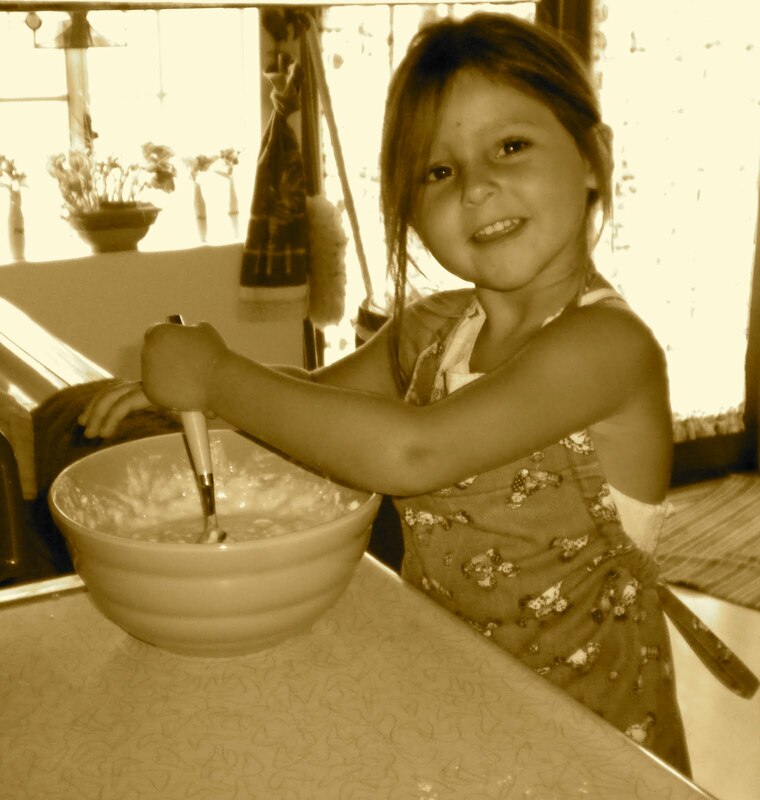 ... and such a sweet helper in the kitchen ... that's what it's all about ... sharing the love! Oh my!! That recipe sounds wonderful..the addition of the blueberries has got to add so much more flavor and moisture to the cake. YUM!